Today, I want to talk about the effects of huckleberry and diabetes problems. Although its good effects, I still remind you that best ways to reduce blood sugar levels is to take holistic approaches with changing diet and lifestyle regimen and not relying on one unique supplement such as huckleberry. Huckleberry is a name used for different plants of family Ericaceae, in North America. This family has two closely related genera named Vaccinium and Gaylussacia. These are rich with nutritional elements, and both the leaves and the berries can be used for the treatment of different diseases as described in detail later. 1. These are rich in phytonutrients also known as anthocyanins , due its antioxidant activity helps to lower their the blood glucose level. 2. These also contain the chromium, which is the mineral very useful in diabetic patients for lowering glucose level. 3. Leaves of these plants also contain flavonoids, which improves the blood circulation in diabetic patients. 4. Tea of the leaves of these plants helps to alleviate the hyperglycemic and glycosuria in diabetic patients, especiallyin type 2 diabetes mellitus. As you may see, huckleberry and diabetes good effects can be obtained by various mechanisms. However, I still remind you not to rely only on this plant benefits. Should continue with positive changes in your diet and lifestyle regimen. 1. Huckleberries have more antioxidant activity than any other vegetable and fruit so can be used against aging and cancer. 2. 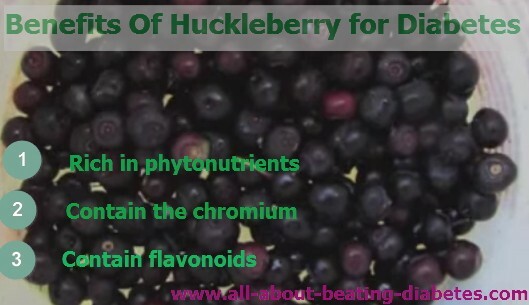 Huckleberries help the pancreas to digest starch and other sugars and fats. This will help reduce the blood sugar levels too. 3. As they contain iron so can be used in anemic patients for the production of blood cells. 4. Huckleberries are used for preparing packs for relieving eczema, running sores and skin disorders. 5. They are associated with lowering blood cholesterol level, muscular degeneration, and protection against heart diseases, glaucoma, hemorrhoids, varicose veins and peptic ulcers. 6. It is a good source of vitamin B, so it is used in improving the metabolism of the body, immune system response and preventing the pancreatic cancer development. 7. Due higher percentage of vitamin C, these berries protect body against prenatal health problems, cardiovascular diseases, immune deficiencies, and eye diseases good source. 8. Due to its antioxidant action, it can protect the body from the harmful effects of the free radicals produced in the body. 9. Tea made from the leaves of this plant are used to improve the starch digestion and for the control of the elevated blood glucose level. As you may see, that is a good huckleberry and diabetes effect obtained. 10. Presence of potassium helps to improve the proper functioning and maintaining the signal transduction system of nerves and muscle fibers of the body especially of heart. 11. Potassium also regulates the elimination of the wastes and the maintenance of the water level in the body. 13. In diabetic patients it lowers the blood glucose level and promotes the production of the insulin so really helpful in type 2 diabetes mellitus. However, once again, do not forget other natural remedies for diabetics and their excellent effect in reducing blood glucose. 14. Against many infections like infections of the urinary tract it proves really helpful. 15. In diarrhea it is used as a laxative. 1. One can alleviate the episodes of the hyperglycemia and glycosuria by taking the tea of the leaves of that plant on regular basis. 2. Its berries are used in breakfast and with other foods for the treatment of above mentioned disorders.